Whether I am helping you relax and increase wellbeing, relieve stress and tension or to treat general aches and pains. I offer Swedish and hot stone therapy to treat all your symptoms. Tanning - Fancy a golden glow and spot of pampering at the same time? 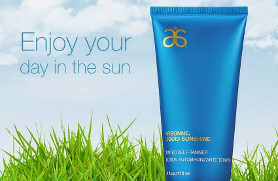 Why not try the Arbonne Liquid Sunshine manual tan application? Turn your tanning session into an hour of relaxation and indulgence that will leave skin feeling as soft and radiant as it looks, with a beautiful instant tan that will develop after 3 hours to an exceptionally natural looking tan that lasts. A detoxifying massage using Arbonne SeaSource Products enriched with marine botanicals, mineral salts, seaweeds & essential oils to deeply cleanse and help rid your body of toxins. An intensely relaxing and rejuvenating massage treatment. Ideal when included in a diet and exercise detox programme to aid weight loss, increase energy and vitality. A full body exfoliation - with essential oils of lime, ginger, peppermint and eucalyptus, to stimulate and purify the skin whilst eliminating dead skin cells, improving circulation and leaving you glowing.